Work brought me to Nairobi this month and what a great opportunity to visit friends around the city. It was a sunny Sunday and my friend Panos organized a BBQ to match the beautiful weather and enjoy the garden of his new place. Of course we started the day with a refreshing fruity cocktail and lots of laughs. In a shaker, mix the rum with the honey syrup , the orange bitters and ground cinnamon. 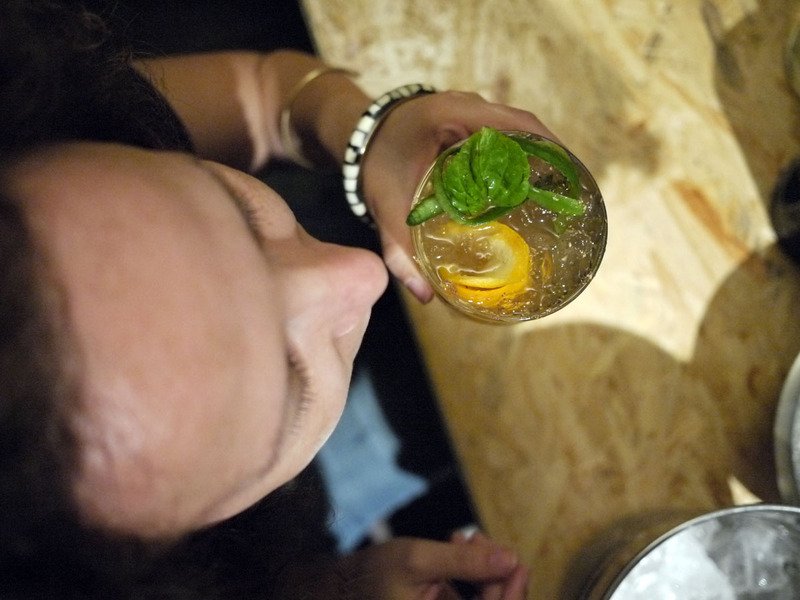 Add a couple of mint leaves and muddle to bring the aroma out from the leaves. 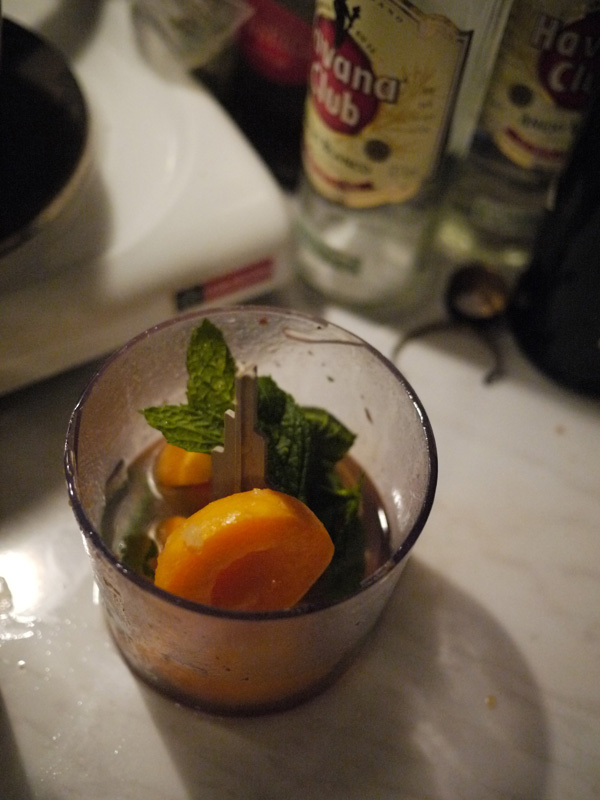 Fill a Julep glass preferably with crushed ice , pour in the mixture and top up the glass with fresh orange juice. 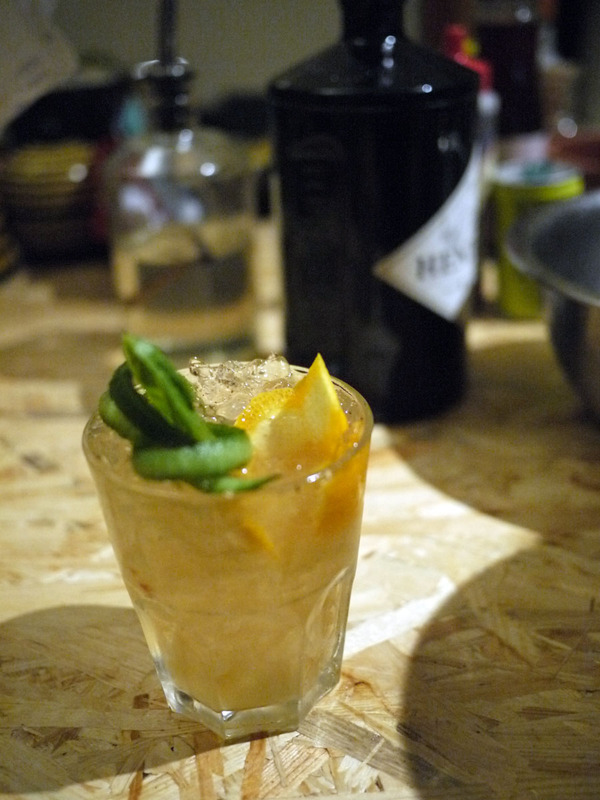 Add the fruits on top of the crushed ice and finish the garnish with the big mint spring. Make sure you you have filled the glass with a lot of crushed ice. In case the liquid mixture covers the ice add more ice before finishing with the fresh fruits. Have a sip and smile! All Juleps need a good stirring with a straw, make sure you use your straw to deep and muddle more the mint spring in the crushed ice. 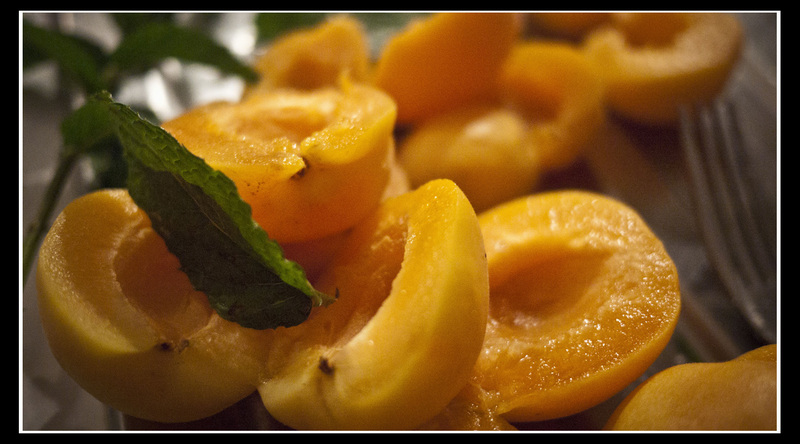 You will love the freshness and smells from the cinnamon-mint reaction. 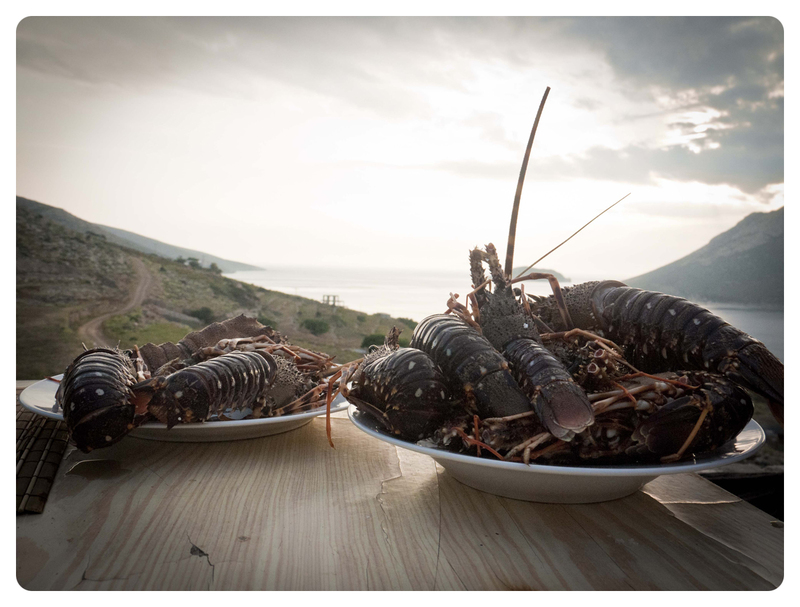 Αστακομακαρονάδα (pronounced Astakomakaronada) is a must-taste gourmet plate if you ever find yourself in a Greek island. 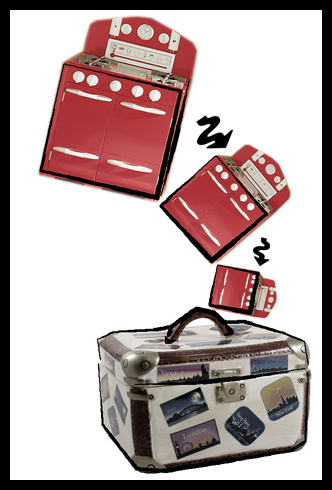 It is also a favourite for Kitchen in a Suitcase so I will gladly cook it anywhere a fresh Lobster can be found nearby. You should definitely try it! First thing first, so let’s take a minute to make sure we know about fresh lobster. In most of the places I cooked this recipe I was very close to the source. In Haiti for example I would look at a trusted fisherman to deliver the lobster alive the same day in a bucket with sea water when possible. Lobsters tend to eat themselves when out of their natural habitat until they starve to death so you need to cook them immediately if you want all the flavour to come out. I know it sounds a bit cruel but if you make sure you don’t buy baby -sized lobsters or from areas of extinction and you are not a dedicated veagan then you will survive and most probably forget about it the moment you take the first bite. So here are some tips on buying supermarket lobster. You can also try here for some extra information online. Chopping the parsley while our good friend Angeliki takes notes for the recipe. In a big heavy-bottom pan with a lid boil water. Add the lobsters and boil with the lid. Be extremely careful as pipping hot steam will escape. Depending on the size of the lobsters I will usually cook for 10-20min maximum. Usually 15 min should be enough but you can also pay attention to your lobsters changing colour. They should have a shiny lively orangish colour by now. Carefully remove lobsters from boiling water and put aside in a strainer. Keep the water in the pan as we will use it later to boil our pasta right before our sauce is ready for serving so we can keep the texture al dente. Here are some tips for cooking pasta. Clean the surface of the boiling water from any foamy or greasy lobster extracts with a spoon. Keep also a cup of this lobster broth separately for your sauce. If you have more than one lobsters separate half and remove the meat from the shell and claws. If you have a big one cut in half and keep half aside. 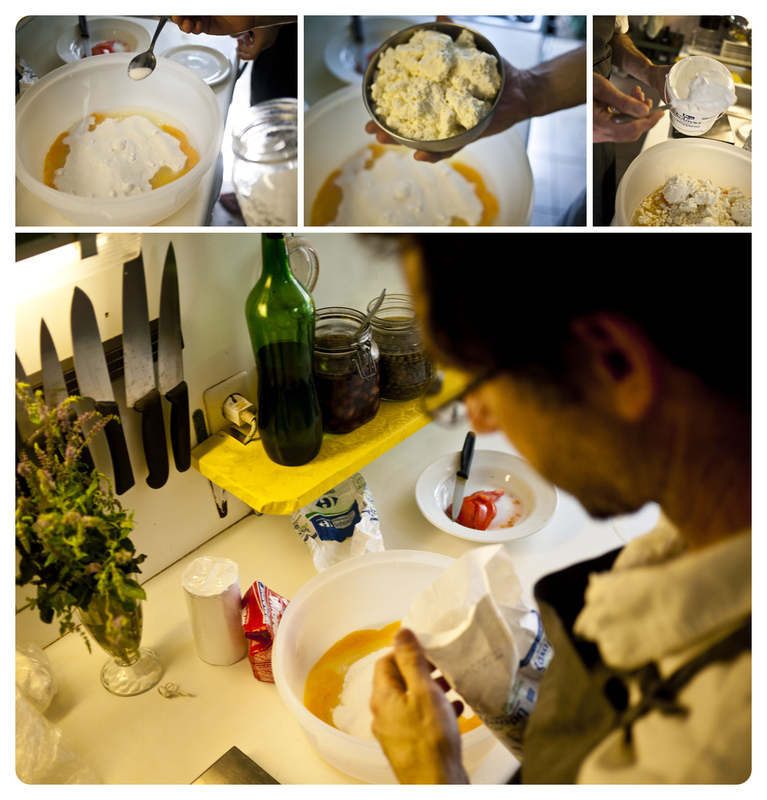 The making of the sauce and preparing the lobster meat. Next step is preparing the sauce. Drizzle extra virgin olive oil in a big sauce pan and saute the sliced onion in medium heat until translucent, add the sliced garlic and stir for 2 more minutes. Add the freshly grated tomatoes, turn the heat to maximum until the mixture reaches boiling point. When boiling add the wine, cook for 3min approximately in high heat and then turn down to low heat. Add half cup of the lobster broth and keep the other half to add progressively as needed. Add the tomato paste, bay leaves, cloves, sugar, salt and pepper, stir and let it boil for 10-15 minutes. If need, add more from the lobster broth to keep a nice sauce texture (not too watery not too thick). Then add the lobster meat and boil for another 5 minutes. Always pay attention to your sauce to avoid burning. When the sauce is ready turn the heat off and put aside. Boil you pasta in the broth according to package specifications, you can add some salt in your broth if you’ld like. Strain pasta, remove the heavy bottom pan from heat and discard any remaining broth. Put the pasta back in the pan, add the sauce and stir vigorously until sauce has covered all pasta nicely. 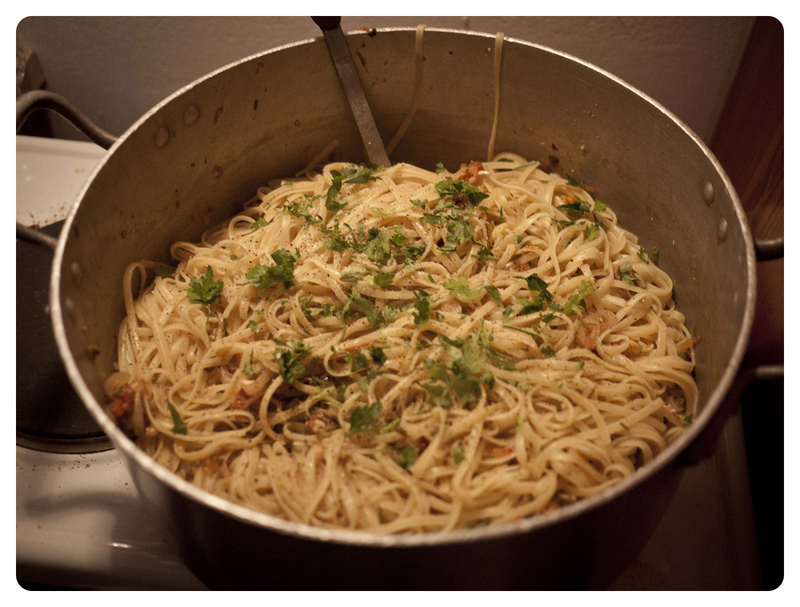 Add the chopped parsley more freshly grated pepper and drizzle some extra virgin olive oil on top to moisture your pasta. Serve hot immediately with the whole (or half) lobsters and parmesan cheese on the side. Let me know how this tasted my friends! Enjoying the food with good friends is what cooking is all about. 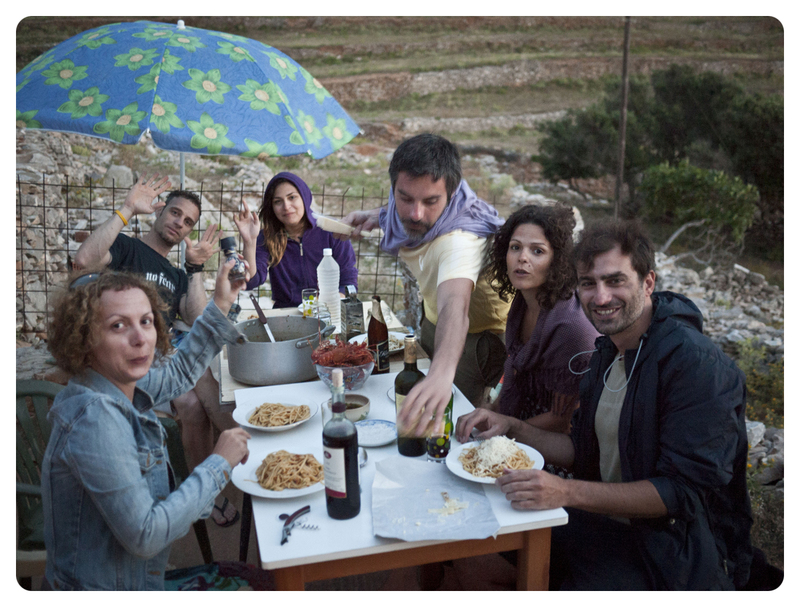 Here we are, ready for a delicious dinner in Amorgos islands on summer holidays. There are a few places on earth where a tourist will feel like home upon arrival and Jazzmin is one of them. Jazzmin, physically is a beautiful coffee shop, bar and occasionally restaurant in one of the most unique Greek islands, Amorgos, but more than that is a social hub, a cocoon of love, serenity and hospitality amidst the picturesque chora (main town) of Amorgos. The fabulous owners and good friends Thodoris and Giorgos who are responsible for this little heaven on earth, will be there to share stories and information about the island or help you find your way in case you are lost! We tasted everything we could from the menu or everything we had time to, cause it’s a long menu with recipes and flavours from Asia to Africa and Greece to Latin America. 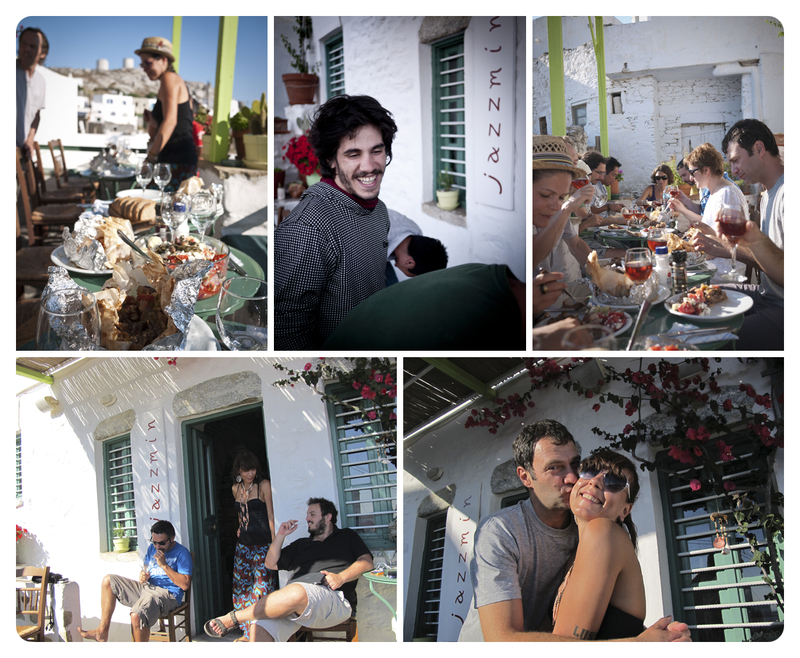 In case you find yourself in the island do not miss the opportunity for a belly-filling, flavour-exploding breakfast. On this trip we also had the unexpected opportunity to sneak into Jazzmin’s kitchen and bake together a New York-style cheesecake with an Amorgian goaty kick. One of their signature recipes. Thank you Jazzmin for sharing this yummy recipe with us. We look forward to another one next summer. Lets start making the crust together with Thodori. Start by finely crumbling the digestive crackers in a bowl. Add the 3tbs of sugar and the butter and mix well with your hands or pestle. 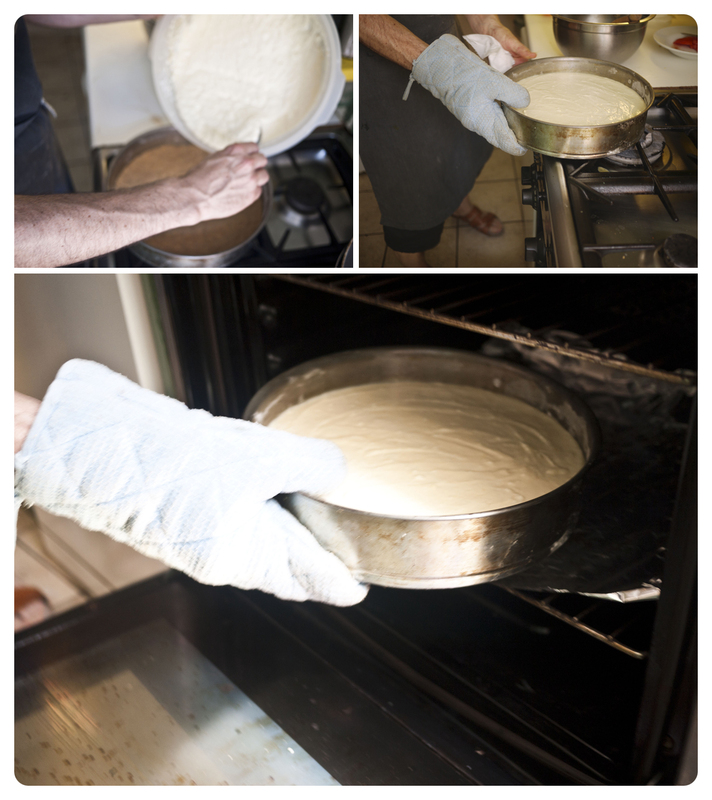 Place the crust mixture in a round 30cm/9 inches pie pan and press firmly with your hand to fix the base. Place in the oven for 5-10 minutes maximum. In a large mixing bowl add yogurt, goat cheese or cream cheese, vanilla powder, sugar, eggs and salt (all the ingredients for the filling) and use an electric mixer to blend well if available. You can always use a whisk instead. Theo mixing the ingredients of the filling. Pour the filling mixture in the prepared pie pan and bake for 60 min at 175 Celsius/350 Fahrenheit. Chill overnight and enjoy some Jazzmin goodness. Final steps and our cheesecake is in the oven. Enjoy! Add all ingredients in a shaker filled with ice cubes. Shake well for 10 seconds. Strain in glass with filled with crashed ice. Garnish with basil leave and a twisted orange pill. Grate nutmeg on top. 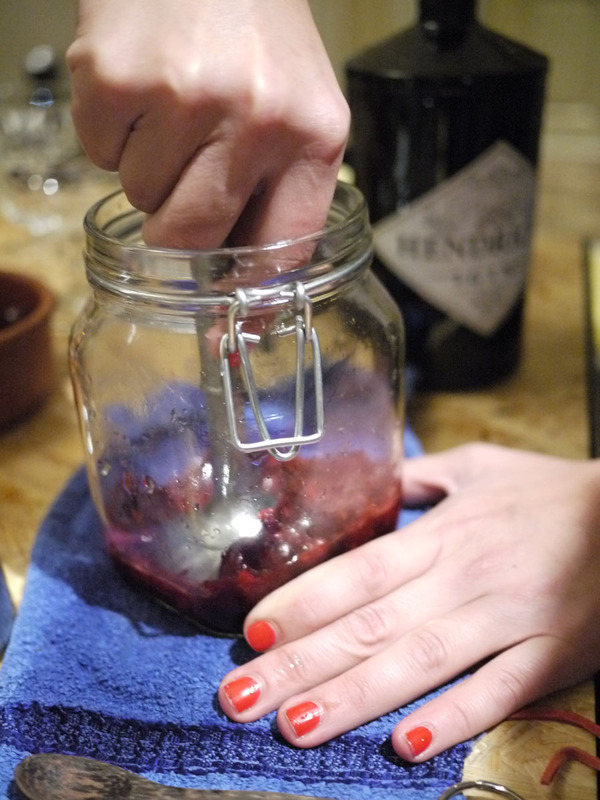 Muddle the sliced fresh cherries in a shaker. 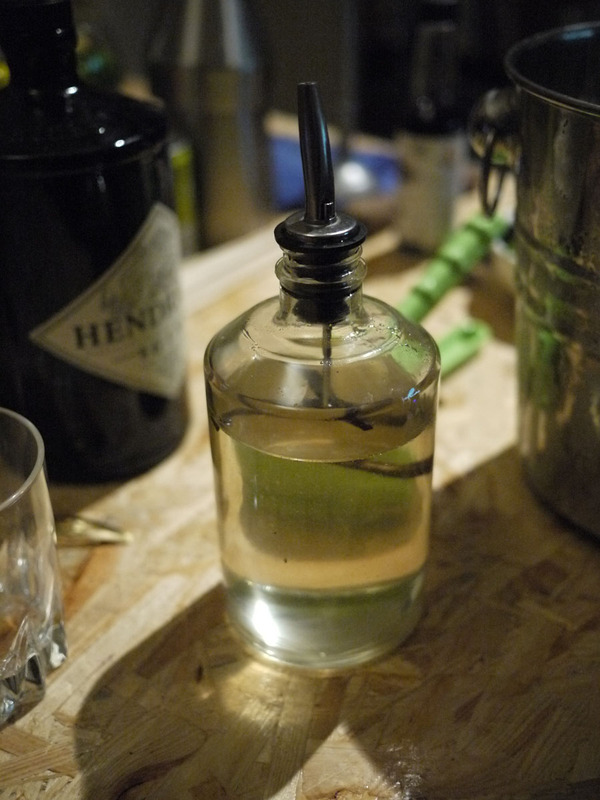 Add the sugar syrup, gin and top with cubed ice. Shake well and strain in a Martini glass. 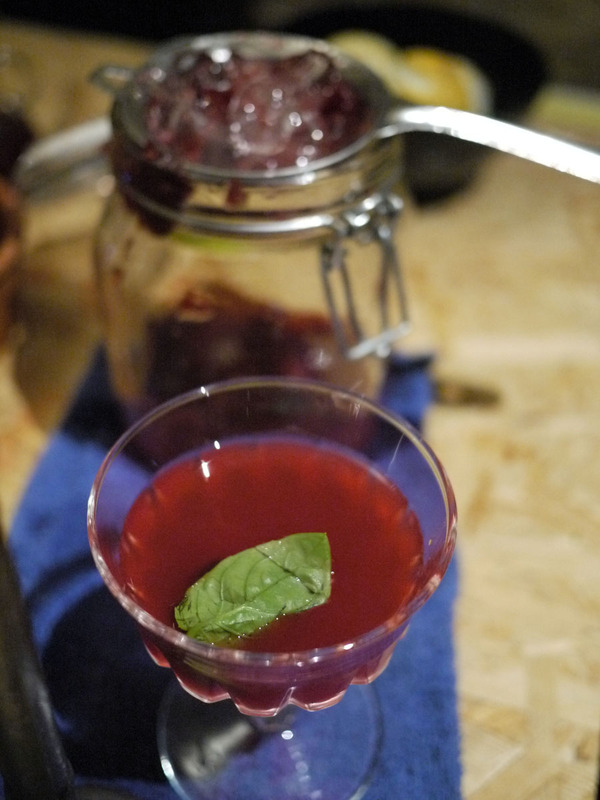 Decorate with cherry and basil leave.